Stock # 116132, Duramax 6.6L Turbo Diesel V8 B20-Diesel Compatible Engine, Automatic, 42704 mi. 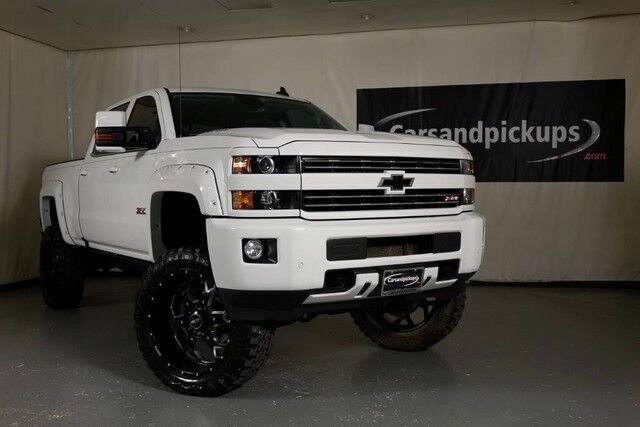 **1 Owner**Clean Carfax**4x4**6.6L Duramax V8 Turbo Diesel Engine**Allison Automatic Transmission**Crew Cab Z71 Edition**24" Custom Alloy Wheels**37" Mud Terrain Tires**Approx. 8" Suspension Lift**Painted Rivet Style Fender Flares**Factory Fog Lights**Projection Headlights**Navigation**Dual Zone Automatic Climate Control**Bose Premium Audio**Key Less Entry W/ Remote Start**Heated Steering Wheel**Leather Interior**Heated & Cooled Front Power Bucket Seats**Rear Folding Split Bench Seat**Power Sliding Rear Window**Spray In Bed Liner**Amp Research Power Folding Steps**Front & Rear Parking Sensors**Reverse Camera**Tow Package**For More Pictures and Inventory go to Carsandpickups.com Call us at 972-239-3688. Trade Ins Welcome! Shipping, Financing, and Warranties Available!!! Text 972-846-4164 for quick answers about this vehicle. Videos available upon request.